Foldable. - magically and magnetically collapses to itself for easy use. Portable. - complimentary velveteen pouch to carry along in your bag and keep it clean. Adorable. 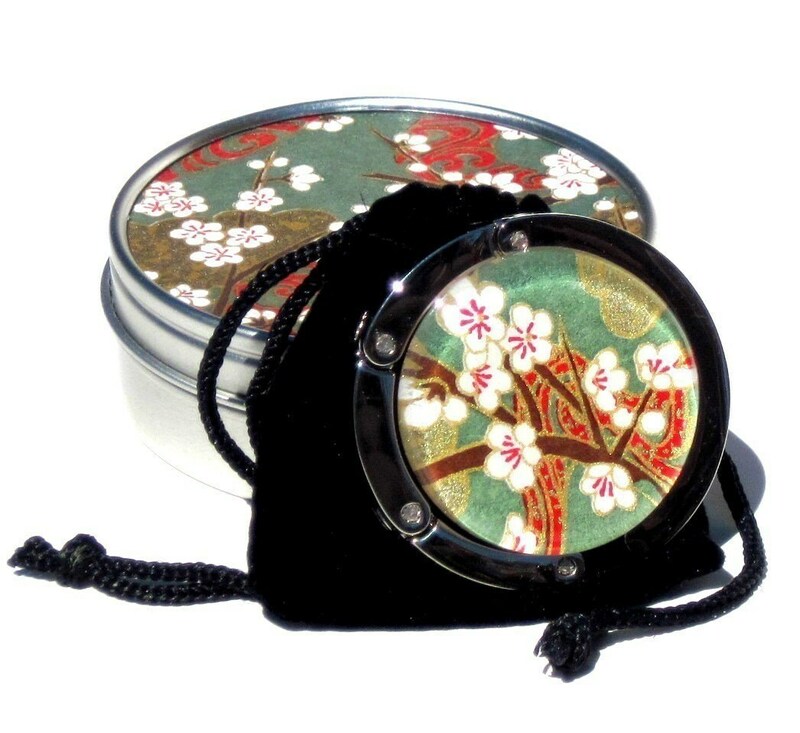 - comes beautifully packaged and ready for gifting in a classic GamiGift Tin. Keep your bag within YOUR reach; not someone elses! These clever little polished steel holders are handmade by me, using my handcut glass and Japanese chiyogami (old-paper). They are also perfect to hold attache cases, diaper totes, backpacks, even dangle stocking stuffers from the mantle and say goodbye to nail holes. Please note...every item is a one-of-a-kind and designs may vary slightly due to the pattern of the paper. Geisha Gem Purse Hook - Tatoo- A Handcut Glass and Japanese Chiyogami Purse or Bag Hanger - Foldable. Portable. Adorable.